I reckon it's time for some Copenhagen supermums. A Christiania Bike is not built for speed, but it's built for cosiness. The solid-sounding Black Iron Horse cargo bike [Sorte Jernhest] is softened up considerably by this elegant Copenhagener. Here in the States we have a bad habit of "keeping up with the Joneses." If your neighbor buys a Ford Explorer, then you have to get a Lincoln Navigator, and maybe the guy down the street will start aiming for a Landrover, etc. 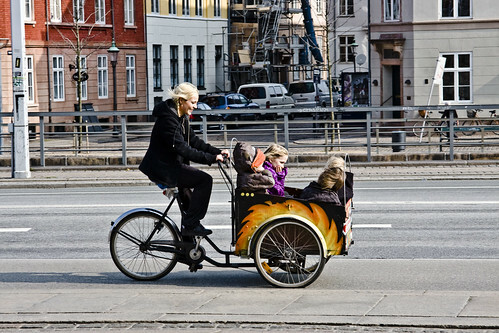 All this brings to mind whether the Copenhagers, like these moms, might not do a little of the same. If you've a LvsH, then maybe I might shoot for a Triobike...or whatever. Or not? but the woman in the first shot is smiling! can't be all that bad! brent: :-) great question. Oneupmanship is not as widespread here as elsewhere... or rather, it takes place on a different level. More subtle. A fancy mobile phone, designer clothing, a beautifully designed kettle in the kitchen, etc. we don't go for oneupmanship on a grand scale. it's just not cricket. on the bike lanes, there is little oneupmanship. if your neighbourhood just bought a nihola, you will consider one, too. but then again, your other neighbour has a christiania bike... hmm... what to do. regarding the larry vs harry, it's the porsche of cargo bikes, like the triobike is the mercedes. but if you're choosing a bike, you'll go for the practical choice for your needs. It's one of the luxuries of Copenhagen transportation that even the "Porsche" of bicycles is affordable in a way that a Porsche is not. Almost anyone could buy a Larry vs. Harry. Perhaps that fact alone mitigates any desire one might have towards oneupsmanship in vehicles. As you say, it's not so much about status as it is about need. As an american owner of a Sorte Jernhest ( who lives in a HILLY area) I can attest, my knees are actually very happy. It's my bum that gets worked which is never a bad thing! I personally LOVE the Supermum shots as I try hard to follow in their foot steps. Ha! I really had to smile once I noticed the flames painted I'd appliqué'd around the wheels on the Christiania! Why doesn´t any of the children have helmets? they are in the middle of traffic! probably because they're not cycling, they're sitting. and they're doing it in the world's safest cycling country. and they're riding on a bicycle lane, separated from the traffic. I live in Copenhagen, and I can say that we still have accidents, so yes, these kids should have helmets. This is not "the norm" for all Copenhagen bicyclists. I live in Copenhagen, and I always put a helmet on my child. Bike lane or not, the cars can hit a bike when turning. unless 'these kids' are your kids, then your opinion is uninteresting. do what you want with your kids, leave other people alone. and learning more about bike helmets would be a brilliant idea. we live in the world's safest bike nation and helmets aren't even designed for impact with cars. Th US has a very strong safety culture but it is often over zealous and potentially very intrusive and as an intelligent blogger pointed out the habit is "uninteresting" at best, it is the "lets be critical of the jones's". Industry loves it from a marketing point of view ---parents are often guilted into the purchases of all sorts of "safety equipment" . I laud the mothers, not resorting to en mass day care, getting exercise, and continuing to interact and show their children the world under her direct guidance. Do we want full body armour for babies in strollers crossing streets? Industry will gladly fund the multiple studies to show "improved safety" but will quietly stand well behind the legislators, government regulators, a legion of lawyers and legal disclaimers (in print so fine insects need glasses to decifer them) when a child gets hurt wearing their often expensive equipment. and the Mother Present is the best, most adaptable safety equipment within the known physical universe.